Frida rocked her 'stache proudly! I wanted to take a cursed Monday and use it to talk about something embarrassingly personal: my mustache. Yes, I have a mustache. I know what you are thinking: is this some kind of joke, like those mustaches that you put on your finger? If only that were true. No, my mustache is as real as they one on that creeper you keep spotting on your block. And it's a sign of probably several things... one, my Italian-ness. We Italian women are best known for a couple of things, great cooking, of course, and growing mustaches as we age. Sheesh. What a way to be remembered. The other sign? My age. It's cool. I'm getting older and so is my face, and my hair is getting more coarse, I suppose.... including my facial hair. I also like to take it as a sign that I have a lot of testosterone. No shame in my game. I dominate. I'm a bossy, high libido having woman and I am not ashamed. But this mustache thing has got to go! On the real, it's pretty faint, but I can see it... like, when I look down. And as much I say "love yourself" and I totally believe it, there are some things that are subject to change. Like, if you don't like leg hair, you can shave it. If you don't like your hair color, you can dye it. And if you are a hot Italian woman with some facial hair, well, you can..... see this is where I am lost. Should I bleach it? Wax it? Should I laser it? Because for the most part, I am a natural woman, I am lost when it comes to my little mustache. The only thing is, this sucker has been bothering me over consecutive weeks. So I have to let it go in some way that doesn't require tons of maintenance. Maintenance, well, it's just not so much my style. I'm a busy woman; a gal on the go. I need solutions, people! So help a Bossy Italian Wife out, here... wax, bleach, or laser? Should I do nothing at all and roll with my lil lip caterpillar? How am I going to get rid of this subtle little upper lip hair that I am beginning to notice. And y'all don't play like you don't know what I am talking about--I KNOW some of you are waxing and dying your way to hair-free existences and I want your secrets! I would say laser all the way for a permanent fix. 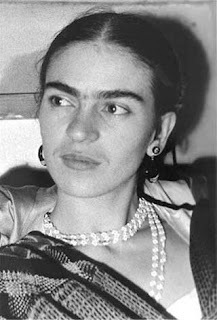 With that said, you could always rock it like Frida and I know you would do it justice! Wax that B... Laser is pretty pricey and I know how much us writers make... I'm not even Italian, but I've still had 'em clean me up once or twice when I felt a little hairy. Hit up the closest little nail parlor or buy strips yourself and say Sayonara to those little buggers!